This month’s used boat review is on the Grandezza 33 OC, a hard-edged 33ft sportsboat. Slotting into the gap between the 27 and the flagship 39, the new 33 OC is the latest sharp-edged sportscruiser from Grandezza. 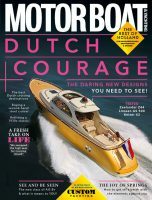 Watch the boat test video of the new Grandezza 33 OC or for the full feature see the March 2013 issue of Motor Boats Monthly.